LABOUR IS PROPOSING a Dáil alliance with the Social Democrats and the Green Party, with the idea put forward by leader Joan Burton today. Despite pressure for Burton to step down and facilitate either a leadership election or the ascension of Brendan Howlin to the role, the acting Tánaiste today proposed an alliance with the SocDems and the Greens during a Labour parliamentary party meeting. There is said to have been broad agreement that the idea should be pursued. Under the new Dáil standing orders, the potential alliance would be made up of the 7 Labour TDs, 3 SocDems and 2 Greens, giving the 12 deputies significant speaking rights and better access to private members’ business. “If we are a big part of a medium-sized grouping we would do better out of it and the SocDems and Greens would too,” a party source said this evening. We’re talking about them because they would have a fairly good, pragmatic and responsible approach to politics in the Dáil. It’s not yet clear if Labour has formally approached either the SocDems or the Greens about forming a Dáil alliance. There was no immediate response the Social Democrats this evening. Speaking in the Dáil, Green leader Eamon Ryan said that small parties and like-minded independents should meet to consider their options. He later told TheJournal.ie that the Greens are open to seeing what such an alliance “with like-minded independents” might be able to achieve. I think it might be one way of unblocking the log jam around government formation if a much wider rainbow coalition proved possible. There has been speculation in recent days that Labour could form part of the next government with some party figures believing, as one senior source put it, that there is a need for “progress and liberal forces to have influence on the next government”. However, many in the parliamentary party do not favour such a move. One senior TD said they would “doubt very much” that Labour would go into government. Howlin is also understood to have voiced opposition to the idea. Burton has held talks with Taoiseach Enda Kenny in recent days including prior to today’s cabinet meeting. However, Labour today abstained on the vote to elect Kenny as Taoiseach. 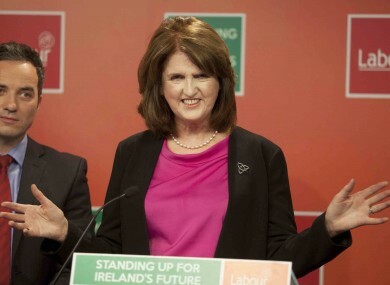 Email “Joan Burton hopes to do a deal with the SocDems and the Greens ”. Feedback on “Joan Burton hopes to do a deal with the SocDems and the Greens ”.